Story dated 18th September 2002. 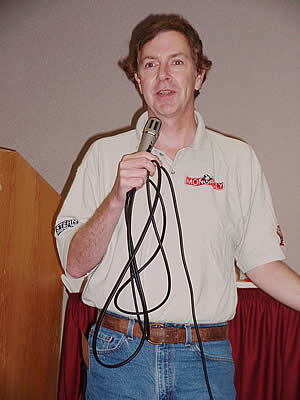 The Dutch Pinball Association magazine (Spinner) is to print an interview with Pat Lawlor about his latest game - Rollercoaster Tycoon - and other pinball issues. Many thanks to Jim Jansen for the interview. Q. When was the first idea to make a pinball from Rollercoaster Tycoon? We decided to do Roller Coaster Tycoon in the September of last year. We contacted the licensing group for the game and agreed rather quickly on a contract. I was my idea to do this license based on how well amusement park games usually do in pinball. Q. How long did you work on it? We worked on the game for around 10 months. Q. What's the goal of the game? The main goal of Roller Coaster Tycoon is to "turn on" rides in your amusement park. That is the same as the PC Game. This is done by changing the small traffic lights from red to yellow to green on each ride, by shooting at that ride. This is how you lock balls for multi-ball. The secondary goal is to get as many people in your park as possible. All shots add guests to the park. Your entire bonus is built on guests in the park. Guests in the park are also one of the ways you can light "extra-ball". Q. How is your creative process working now you really have to take care of the money you spend? Are there any gadgets in the game like the mini-flipper in Monopoly? The amount of money we have to spend on the bill of materials for a game certainly influences how we think about design. That has never changed in my years in pinball. There are 3 "gadgets" in the game. The first is the dummy for the "Dunk The Dummy" sideshow. The second is the drop down ghost target on the middle roller coaster. And the third is the spinning wheel target. Q. What are your expectations for the game? Gary Stern and I both have high expectations for the game. Q. How is it to be one of the last active pinball designers in the world? You ask about being one of the last active designers of pinball. I view that 2 ways: First, I view it as a challenge to get the game of pinball back to its larger status of a few years ago. Second, I view it as a need to teach other people about the craft that I have learned and must be passed on to others. Pinball will suffer if the really creative people are all gone and there is no-one to teach what they know. Q. Are you (still) going to arcades or pubs to play? Are you checking (or listening) to people if they play one of your machines? Yes I still watch people play the games and still learn a lot from watching what they do. Q. Do you have other pinballs at home besides the ones you've designed? What's your favourite machine that you didn't design? I have one of every game that I designed at home. That takes up a large amount of space! My favourite machine besides my games is High Speed by the great Steve Ritchie. I also like an old game designed by Steve Kordek about 1970 called 7-Up. Q. What else are you doing besides designing pinballs? Besides pinball machines Pat Lawlor Design Inc. also designs redemption and other coin-op equipment. Q. Your first machine for Stern was Monopoly. How do you look back on that game? Do you think the quality of Stern machines will ever match that of Bally/Williams machines? I think Monopoly is proof that Stern Pinball can be as good as Williams Pinball. Many people in our business have said exactly that. Sometime people like to live in the past and cannot get past labels. Williams is gone. It will never be back making pinball. But the talented people can (and are) back making games for Stern. I am a huge believer that the people make the fun in a game happen. That the game is made by Stern or Williams or some company on Mars is irrelevant. Great games come from great people. Gary Stern very much should be congratulated for keeping pinball alive. Gary is trying to build quality products that will sell and make money in today's marketplace. I believe that without Gary there would be no new pinball machines for people to play today. Q. Did it sell well? Monopoly sold very well. (As well as a Williams game of the era). Q. Is Rollercoaster tycoon a better game? Roller Coaster Tycoon is a somewhat different game. As I said we have high expectations for RCT. Right now the quality of a Stern game is equal to that of any Williams game I ever worked on. But we cannot stand in place. There are more improvements coming in the next year or so. I can't be more specific, but stay tuned! Q. Do you know something about pinball in Holland? I've never been to Holland. I'm not much of a world traveller. I have only been to Europe once and I visited Germany for a trade show. My schedule makes it hard for me to travel much. Q. How do you see the future of pinball? I think the future of pinball is bright. We are once again starting to sell more new games. A new generation of players is discovering the game of pinball. I wouldn't be still doing pinball machines if I thought they were a dead issue. Q. What will your next machine be? We are just now talking about our next pinball title so I can't really say yet. I wish you and your readers well and thanks for playing our games.